OUR BUSINESS NAME & WEBSITE HAVE CHANGED. 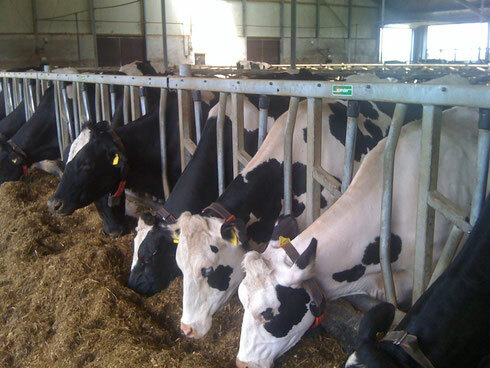 Around 80% of a cows energy and 70% of her protein requirements are supplied by the rumen microbes. Keeping the fibre “busting” microbes working efficiently is the key to maximising the utilisation of home grown forages. The bio-active metabolites in Syn-Vital help to stimulate the population of these microbes, a process that can take two to three weeks. Syn-vital helps promote rumen activity especially in animals undergoing nutritional changes, those fed starch rich diets - typically those containing high levels of concentrates or maize silage -and when diets containing poor digestibility forages are fed. Transition group ( from three weeks before calving). Fresh calved group ( until three weeks after calving) . Early lactation group (1st 100 days of lactation ). Calves to promote rumen development and a healthy digestive tract. Beef cattle and tups been prepared for shows and sales. Dairy cattle : 30 - 50 gms per head per day. Calves : 15 gms per head per day mixed with dry feed.